Best Coast performs during Make Music Pasadena 2011. Summer doesn't officially start until June 21st but that doesn't mean we can't start early with the return of Make Music Pasadena presented by 89.9 KCRW on June 1st. West Coast's largest free music festival, boasting multiple outdoor stages while also hosting over 100 bands, 150 free concerts, expects over 35,000 music lovers to attend this years events. This year's lineup features Tanlines, Yacht, Robert DeLong, Hunter Hunted, We Are Scientists, Las Cafetera, Superhumanoids, Soko and many more including a special guest headliner to be announced later this month. The diverse lineup will feature every musical genre; from classical, rock, indie rock, Latin, folk, jazz, etc. Past artists taking part in this all-day, all ages Best Coast, The Cults, Grimes, Grouplove, Ra Ra Riot and Zola Jesus . 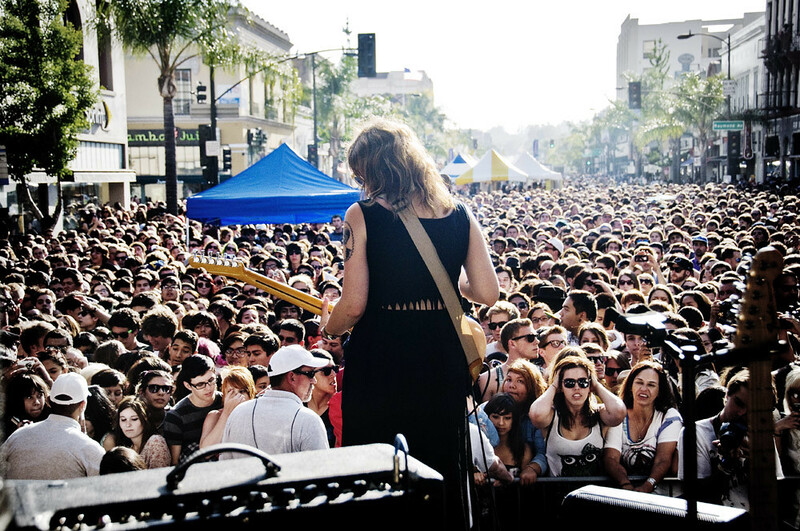 Modeled after the Fete De la Musique event that began in Paris in 1982 as a way to celebrate music, Make Music Pasadena's aim is to promote music for all ages and from all cultural and social backgrounds - all with no cost to the audience.